24th International College Teaching and Learning Conference, Ponte Vedra, FL. 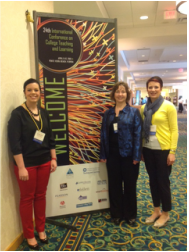 I presented at the 24th International College Teaching and Learning Conference in April 2013 with Dr. Heaton, Lee Ann Porter, and Melissa Farrish. Our presentation, "Gaming and Learning? Taking a Look Beyond the Book" stemmed out of our work in Dr. Heaton's class on Curriculum and Technology where we explored the impact of gaming principles on education. What do you think about gaming and what does it have to do with education? Most of my students are skeptical that one has anything to do with the other. However, instead of asking them to take my word for it or to accept the word of authors on the subject, students conduct their own research and decide for themselves. During this session instructor and students team up to share their efforts to make learning real by going beyond the book to see What Video Games Have to Teach Us about Learning and Literacy (Gee, 2007). 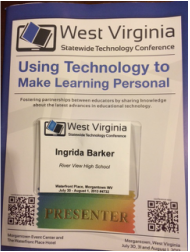 The presentation for WV State Technology Conference, "Gaming Principles and Personal Learning" was a follow-up on our collaboration for the conference in Florida with Dr. Heaton, Lee Ann Porter, and Melissa Farrish. Many adults see gaming as “a waste of time”; however, a few authors and educators disagree. Steven Johnson (2006) suggests looking beyond the content of video games to the underlying “cognitive workout.” James Paul Gee (2007) discusses this workout in terms of 36 learning principles inherent in quality video games, including: active learning, collaboration, critical thinking, discovery, incremental learning, multimodal delivery, practice, risk-taking, situated meaning, and transfer of knowledge, among others. To learn more presenters experienced gaming through interviews and game play in order to draw their own conclusions. Findings and recommendations for educators will be shared. 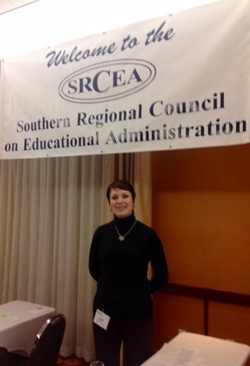 I have presented two papers at SRCEA Conference in October 2013. One presentation stemmed from my survey research on Sustained Silent Reading in McDowell County Schools in collaboration with Dr. Childress. I have also presented a paper started in Dr. Heaton's class Technology and Curriculum on Pioneers Creating a Community, in collaboration with Dr. Childress.